I read this article and found it very interesting, thought it might be something for you. 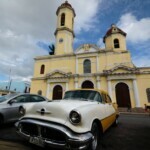 The article is called Cienfuegos in one day – Explore the Pearl of the South and is located at https://capturetheatlas.com/cienfuegos-cuba-in-one-day/. 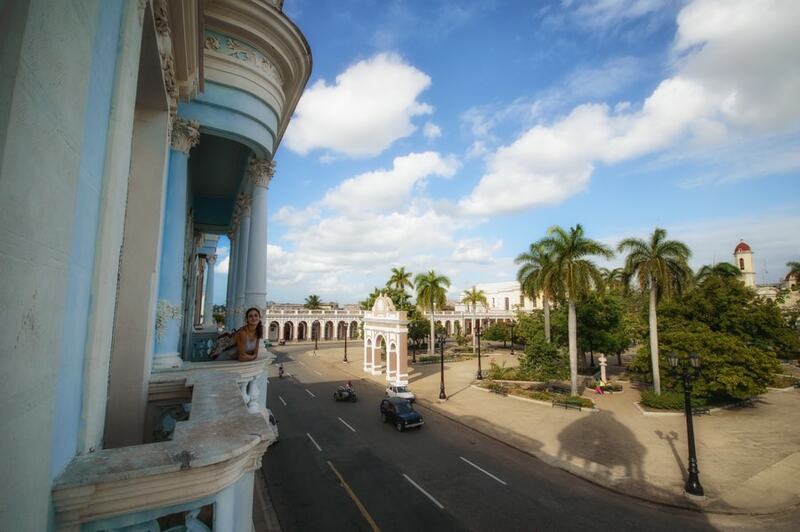 Discovering Cienfuegos in one day is mandatory during your trip to Cuba. The reason is that neoclassical buildings of the so-called Pearl of the South, have been awarded the title of Cultural Heritage of Humanity. 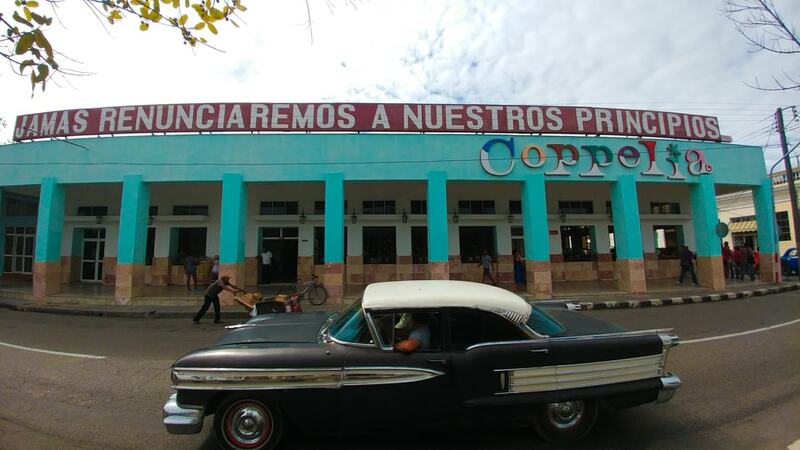 It is a very common stopover on the way to Trinidad, as Cienfuegos is only 1 hour and a half from this popular city. Although a day trip is enough to visit it, we decided to stay one night. 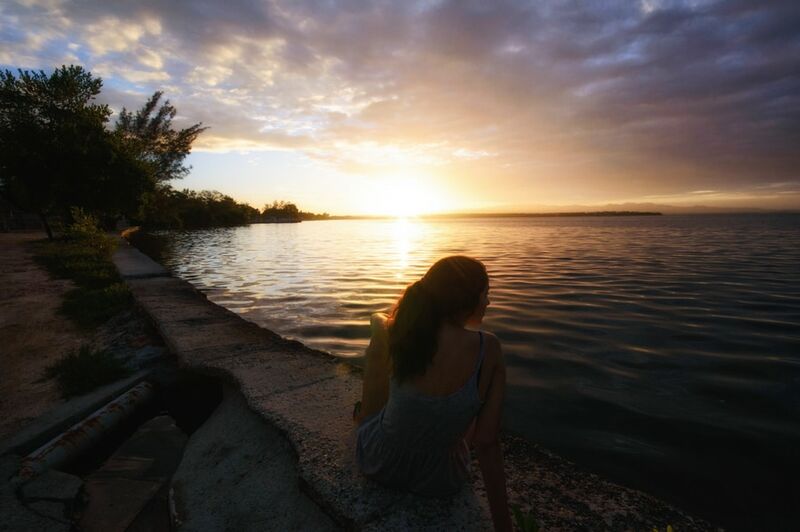 Apart from the urban center where most of the tourist attractions are concentrated, what we liked most about Cienfuegos was the sunrise and sunset from its Malecón (boardwalk) – those in Havana didn’t really compare. 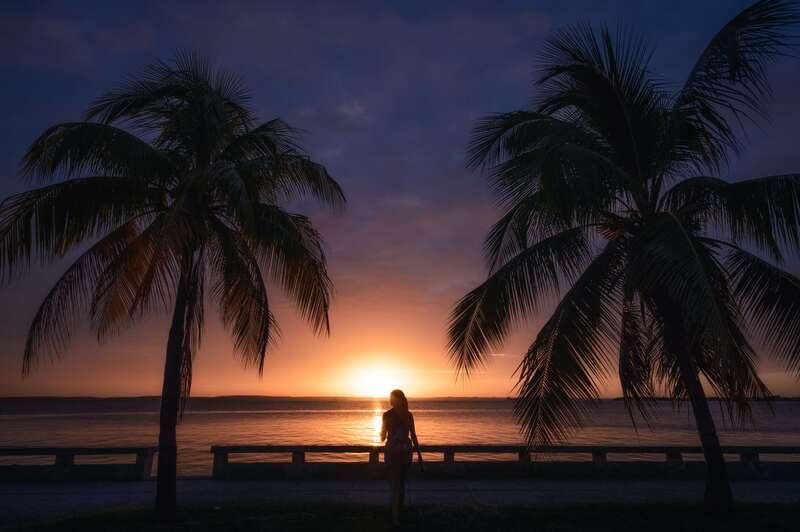 So, if you like good twilight photographs, we highly recommend you to spend a night in Cienfuegos and enjoy these moments of warmer lights. 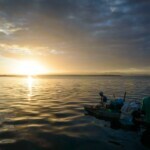 Cienfuegos can be visited perfectly in a day. Most points of interests for tourists are centered around the José Martí Park. 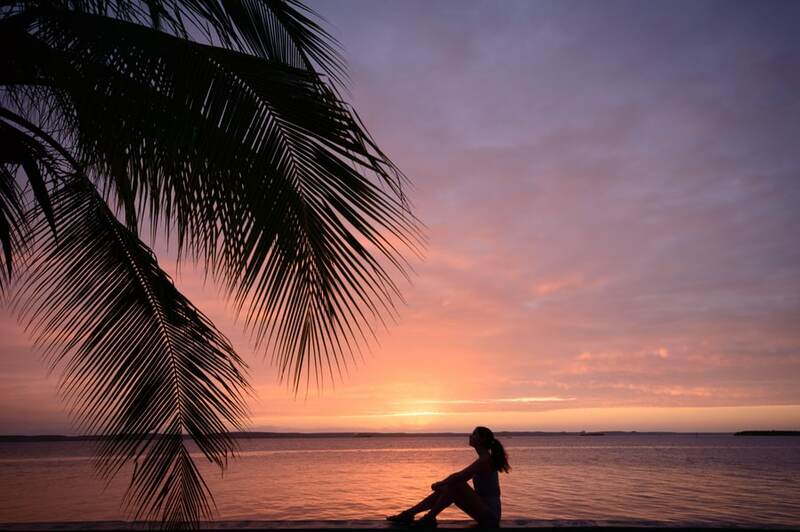 The area that we liked the most was Punta Gorda. 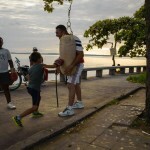 This can be reached by walking through the entire Paseo del Prado until it has become the Malecón of Cienfuegos. From here, you can enjoy the sunrise/sunset which make it worth staying at least one night in the city. Surrounding the José Martí Park are the most emblematic buildings of the city. 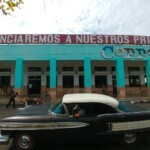 It is, so to speak, the heart of Cienfuegos. Most of the tourist shops are located bordering the park itself. This eclectic style building from the late 19th century is the jewel of the park. The Ferrer Palace, located at the José Martí, takes away the prominence of any other building. Its intense blue color, which we will also see in other buildings in the city, hides that it has been in a long process of restoration. 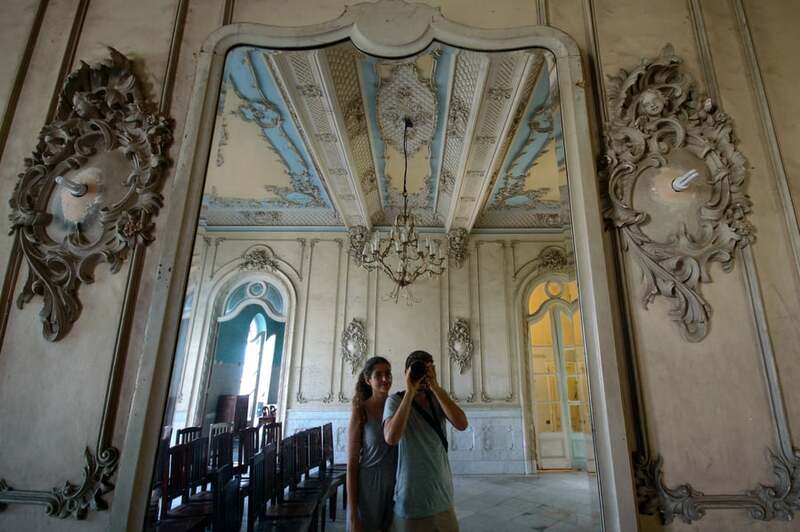 When we went up to the first floor, we discovered that there were workers repairing the defects caused by time, replacing the marbles and putting in the finishes. The palace is a gem even though it’s only half done. 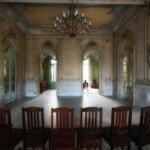 The size of the rooms and decoration details revealed the purchasing power of the former owners. When we looked out on the balconies, we saw another view of José Martí Park and its Arc de Triomf. 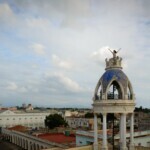 The monument was built voluntarily by the workers of the city to celebrate the independence of Cuba. 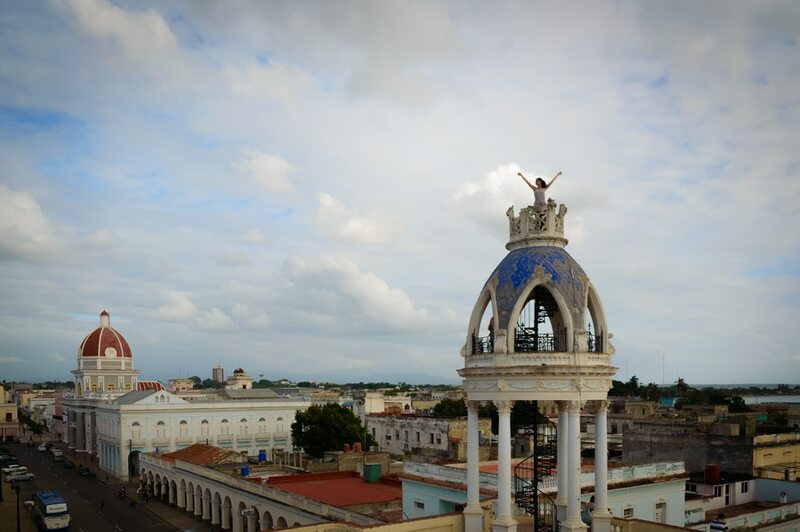 What stood out most from the palace is its lookout tower from which you can see all over Cienfuegos. The Catalan merchant who built this tower intended to control the entry of ships and goods to the port. 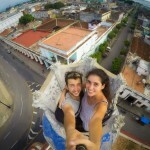 From here, you can absolutely see all of Cienfuegos. And yes, you should abstain from climbing it if you have vertigo, because if you are my height, you will have more body above the viewpoint than below when you reach the last step. 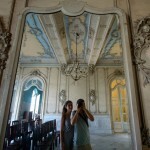 Perhaps what surprised us most about Palacio Ferrer is the use of its lower floor as the Provincial House of Culture. 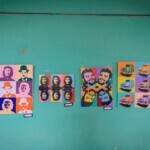 This space has been reserved so that local artists can show their most carefree works, as well as to rehearse plays and dance performances, etc. The decoration has nothing to do with the first floor. Here, it shines more by the lack of such. 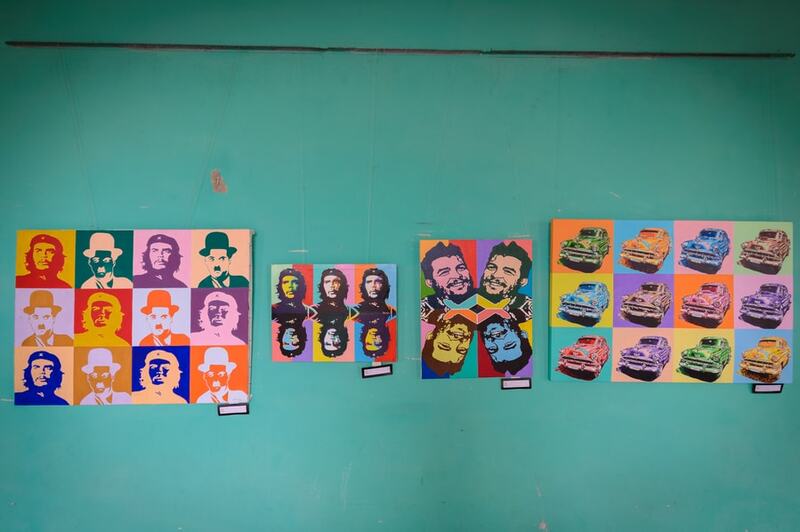 Clear and vivid colors were randomly distributed on the walls that flaked over times. There were lilac, yellow, and green rooms. A good canvas for a photo shoot and playing with the lights through the windows while hip hop music sneaks in from the next room, where a group was rehearsing a choreography. At the other end of the park is the neoclassical style Catedral de la Purísima Concepción. 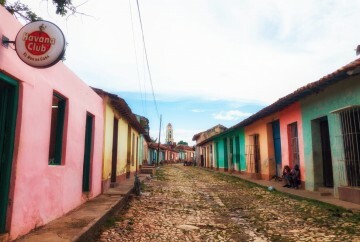 Cienfuegos had not been inhabited before colonization. 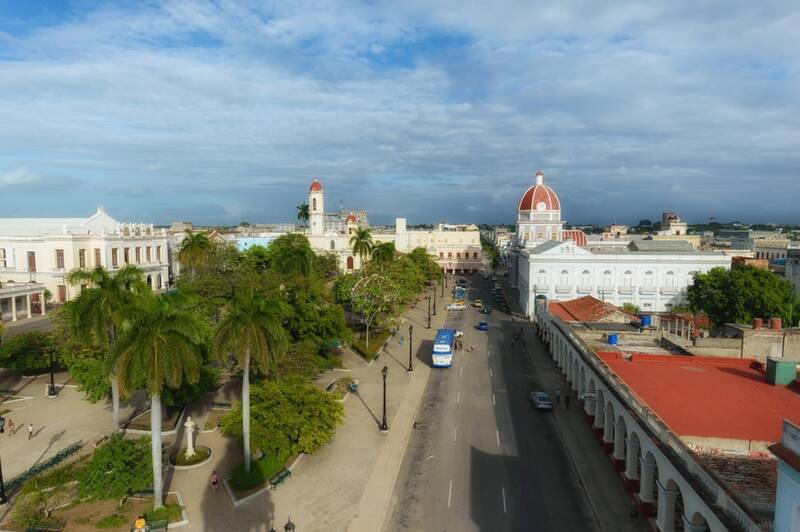 However, when the Spaniards arrived, they decided to establish a city there since the bay of Cienfuegos was ideal for building a port. 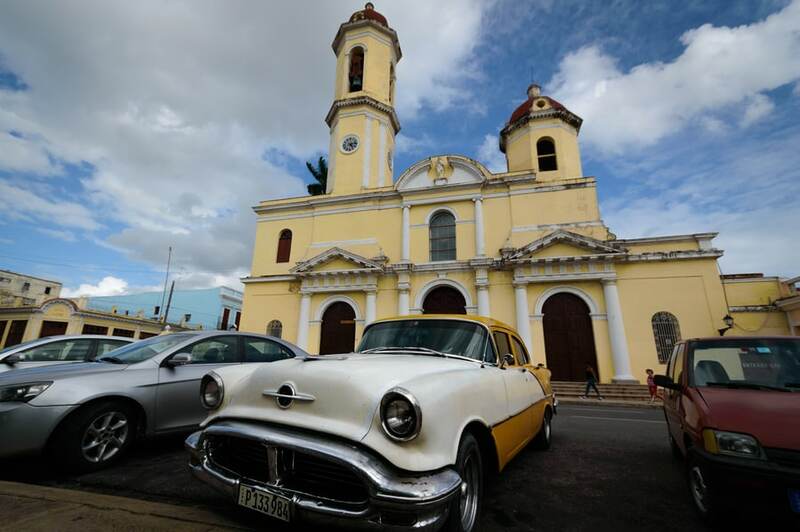 With the foundation of Cienfuegos, the first mass was celebrated in the same land that occupies the cathedral today. Two other buildings that will not go unnoticed during your visit to the José Martí Park are the Government Palace and the Tomás Terry Theater which are arranged one in front of the other. The Paso de Prado is the main artery of the city. 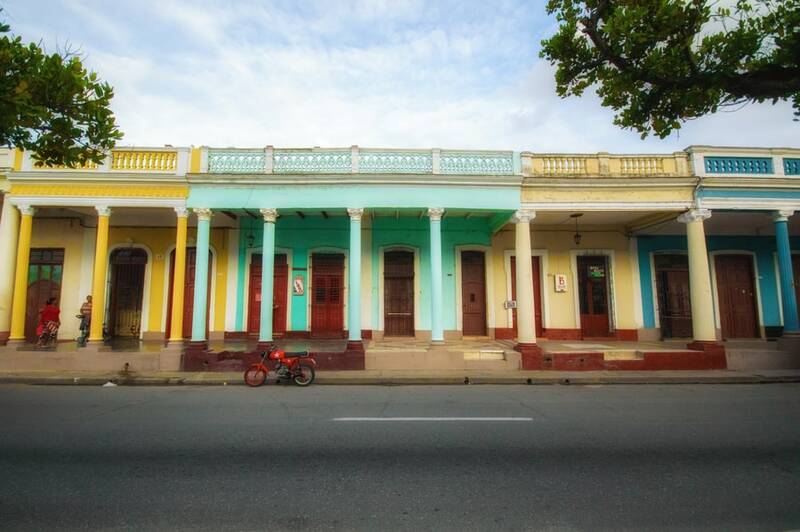 If you explore Cienfuegos in one day, it gives you time to walk at least a large part of it. 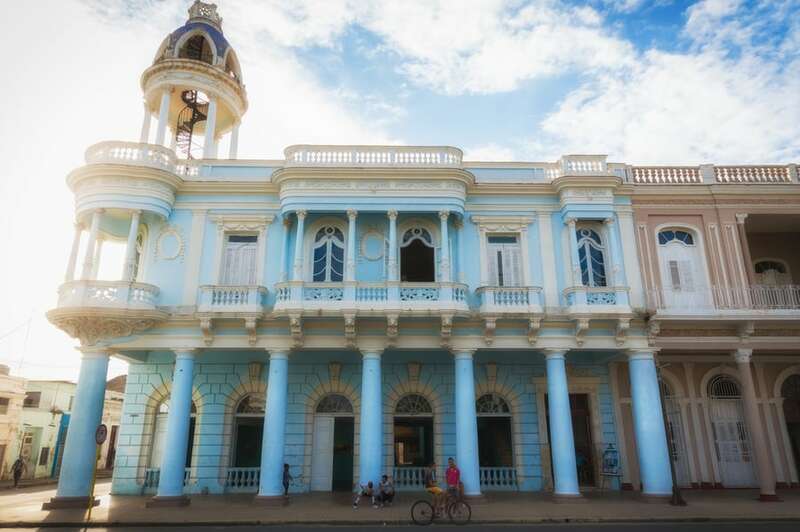 Although few tourist attractions are here, this is where you find the essence of Cienfuegos. 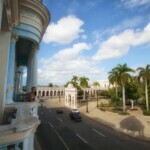 Just two kilometers in length, it is the largest promenade in Cuba. 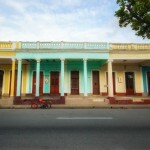 And just as Cuba itself, the Walk of Cienfuegos is also a permanent contrast between decadence and splendor. 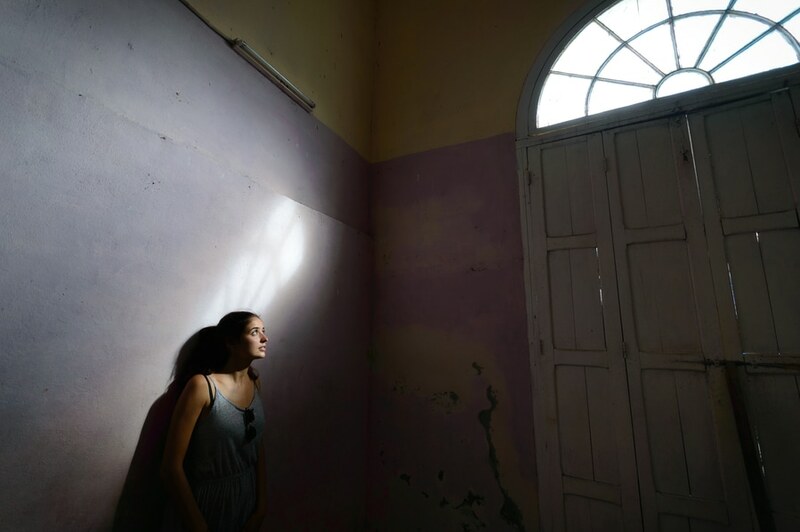 I encourage you to go as far as possible and discover for yourself all of the colourful colonial houses, from those of the highest level, to buildings in ruins. 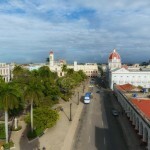 The Paseo del Prado avenue cuts Cienfuegos from North to South. In the middle of the avenue, there is a pedestrian crossing with palm trees and very nice benches where you can sit and relax. However, do not stay only in the central part of the walk. At the sides, you can find unique places like the shake house. In this place, you can have a very cheap fruit shake since it is paid in CUP. I was surprised by the place since you can see how they make the shakes based on a paste, which we assumed is made from fruit and water. 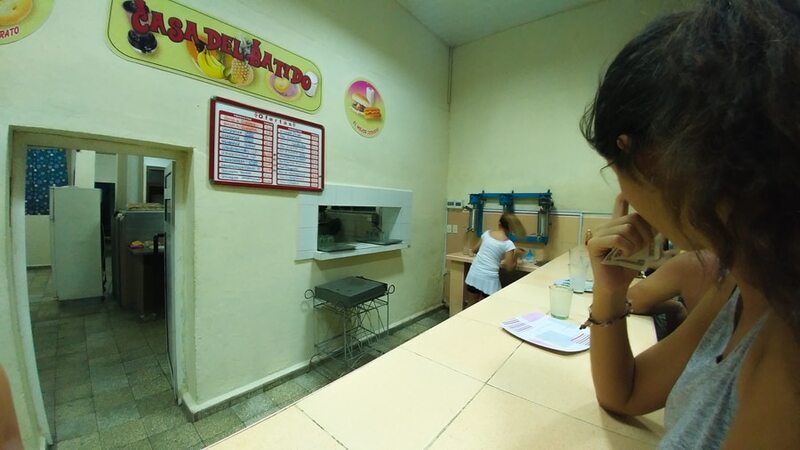 In addition, if you didn’t try a Coppelia ice cream in Havana, on the Paseo de Prado in Cienfuegos you will have a second opportunity to try one. 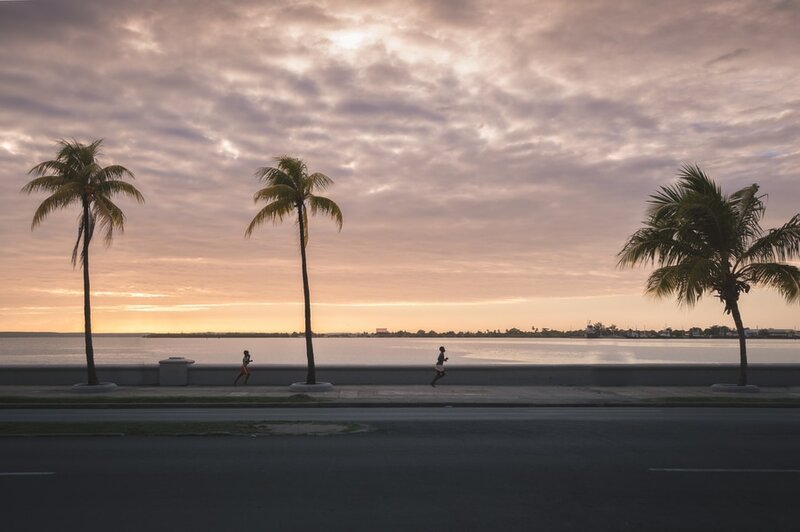 In the southern most part, the Paseo del Prado momentarily becomes the Cienfuegos Malecón. 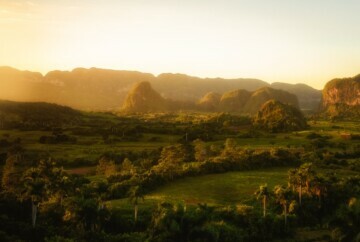 From here, we will find a Cuba that you have not imagined. 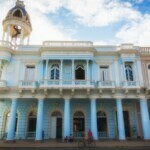 Intermingled style mansions make Cienfuegos the most eclectic city in Cuba. 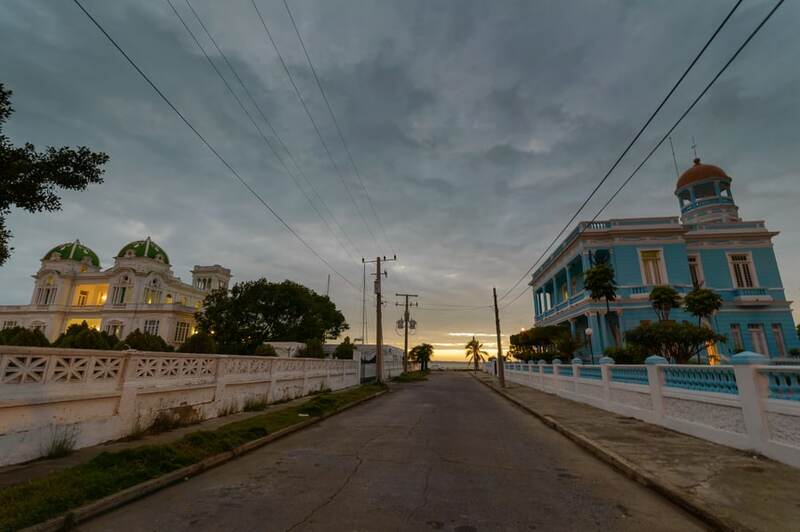 This is the end of Cienfuegos, Punta Gorda, as fat as the wallet of the owners of these historic homes. 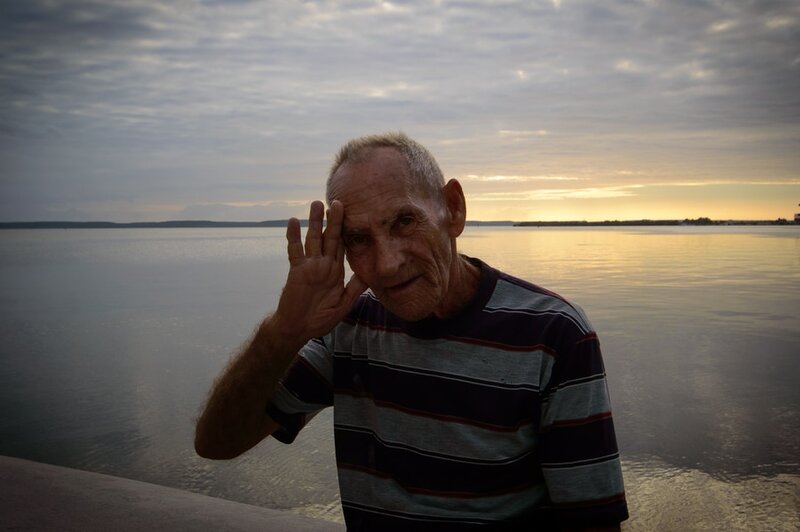 The best part of discovering Cienfuegos in one day is the walk along its boardwalk. 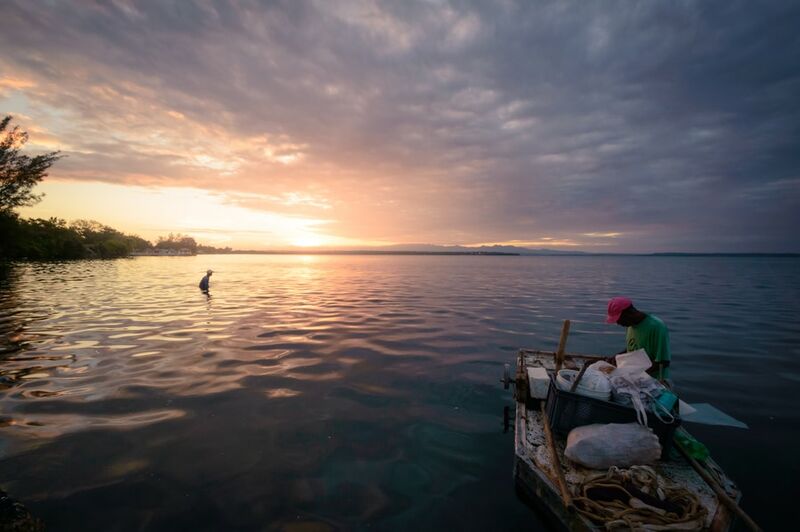 The Cienfuegos Malecón does not overlook the sea but to the Bay of Jagua. 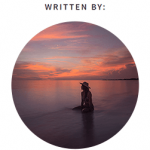 Its calm waters are navigable by those ships that cross the narrow channel that connects to the Caribbean Sea. The best time to visit is during sunset. When the heat stops, local Cubans comeout to enjoy life on the boardwalk. This is the best time to approach and talk about any topic with the locals. 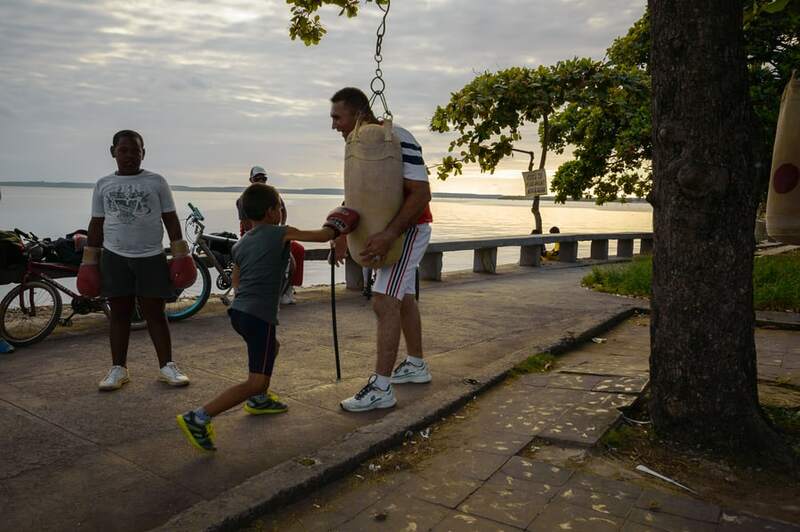 If you are lucky, you will also see children boxing at sunset since it is one of the national sports. While the coach prepares one of his students, the others keep training. some with the rope and others running along the boardwalk, which begins to change in color. 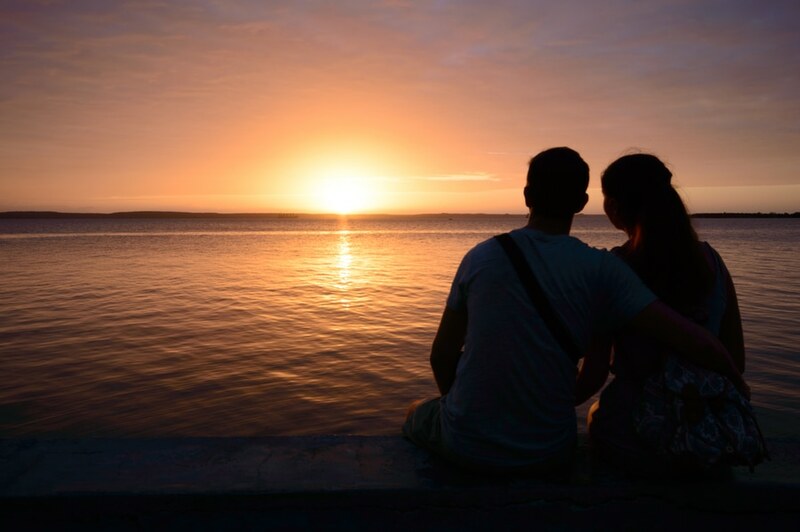 Walk over to the West Coast where the seawall ends, and we promise there will be dreamy sunsets. 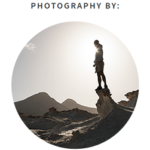 You will have the best shots right at the moment when the sun crosses the horizon. 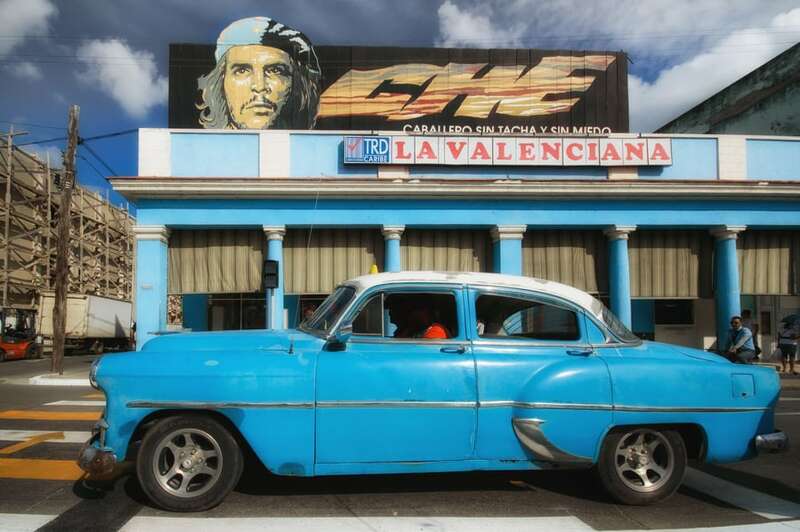 Unlike the Malecon in Havana, the one in Cienfuegos is much more painstaking. 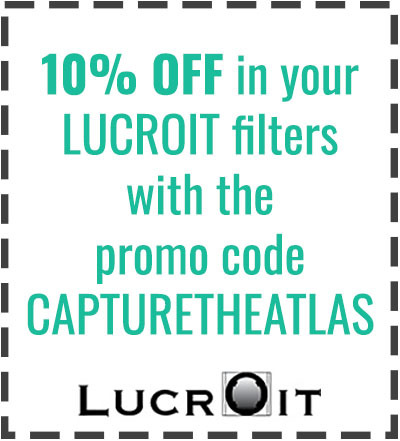 The decoration of palm trees will be the icing on the compositions of your captures. 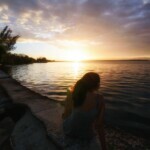 And this was just the first of many sunsets that Dani and I saw on our visit to the island. We were in paradise. 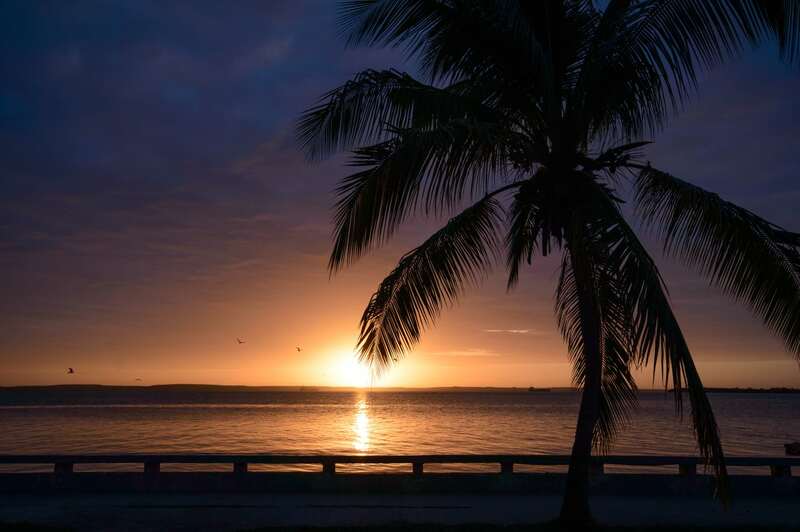 However, even after the sun goes down, Punta Gorda does not stop shining thanks to all the super luxury mansions that will literally leave you speechless. 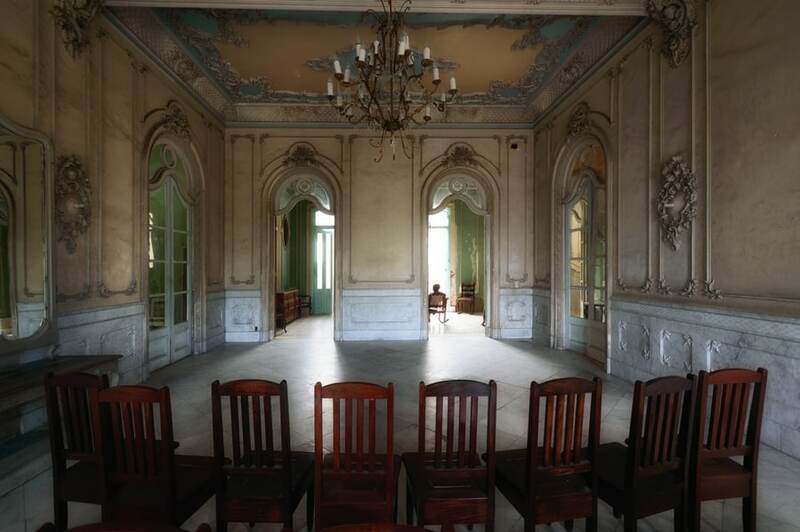 You will find striking mansions such as the Cienfuegos Club or the Blue Palace, with indefinable styles since they are a mix all kinds of elements. 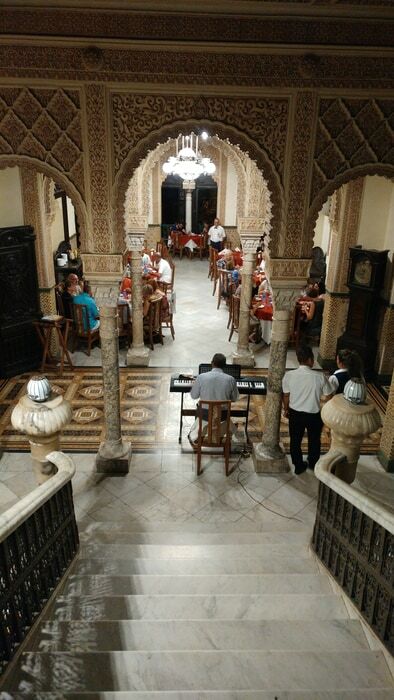 We entered the Palacio de Valle, which was at the end point and now functions as a restaurant. We did not have the chance to look at the menu but we knew that it would not be cheap. 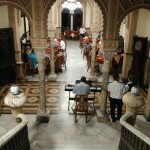 The interior, with all kinds of Moroccan decoration, was not something we expected to see in Cuba. Although without a doubt, the best would be its upper terrace where they played live music. Like this palace, there are many others in this area. Most of them are currently hotels or restaurants, so if you have a bigger budget, it may be a good idea to stay in one of these mansions, especially so that it does not take long to get to the Sports Fishing Area the next morning. 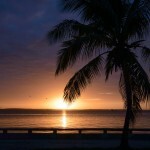 This small, east facing bay of Punta Gorda is the best place to take pictures at dawn. 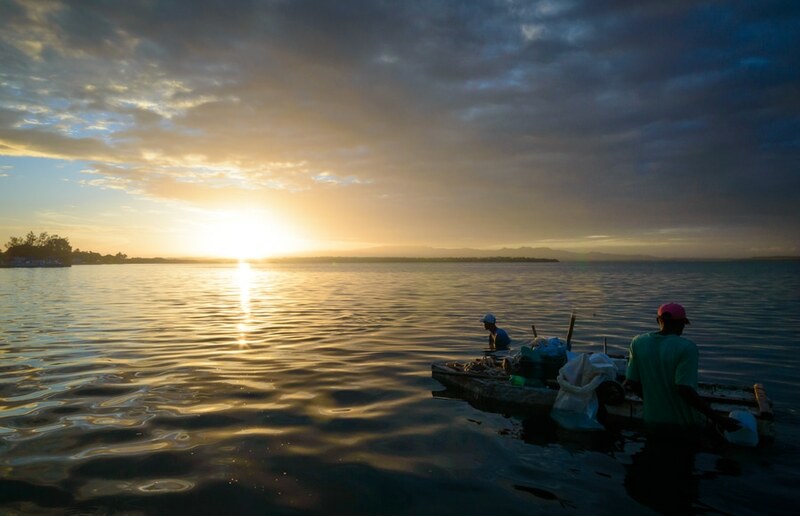 During the first rays of light, not only do photographers congregate in this area, it is also quite usual to meet Cubans who are practicing cebe fishing. 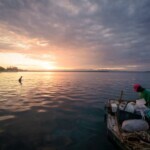 From what we saw, this type of fishing consists of dragging a net and picking up the shrimps that remain trapped inside. This takes advantage of the shallow depth of the bay in this area. 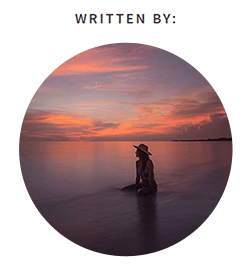 This dawn marked a before and after in Dani’s photography. 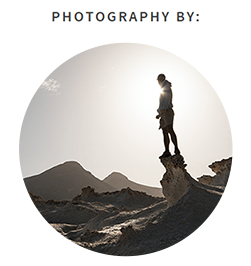 What looked like a catastrophe was instead a turning point for him. While changing the lens after a couple of shots, it fell into the water. 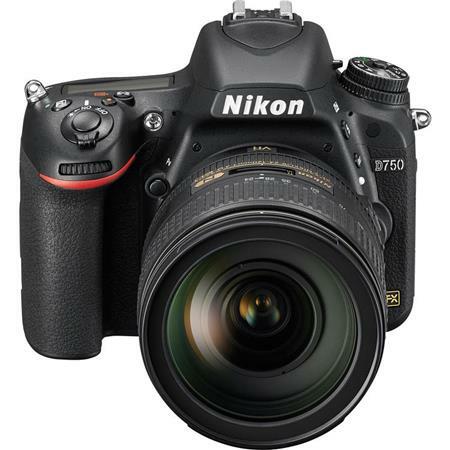 His first camera was already running a little short, so this is the last trip you will see him using his Nikon D3200. 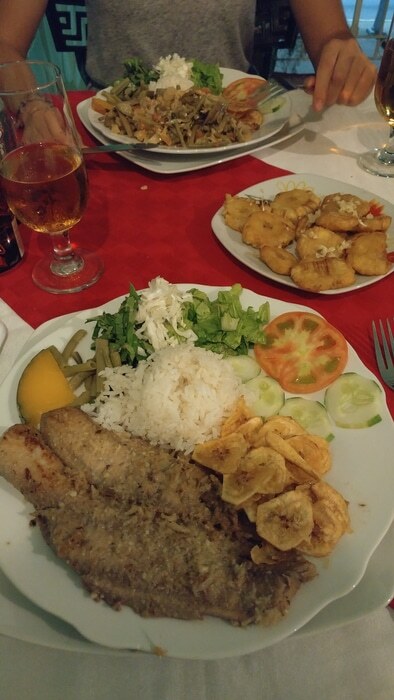 In Cienfuegos, there is no place as exquisite as Doña Nora’s paladar to eat. Its eclectic decor, soft live music, variety of dishes, and views of the Paseo del Prado, make it the ideal place to dine. 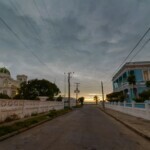 We booked a table on the way to Punta Gorda when we went to see the sunset, and had dinner there on the way back to the center of Cienfuegos. Even for low season, the restaurant was quite full. 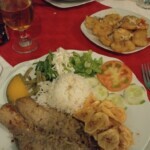 It is highly recommended to book a table, especially if you visit Cienfuegos in high season. Also, if you show up on time, you can ask to be seated on the terrace and enjoy a perfect and romantic candlelit dinner. 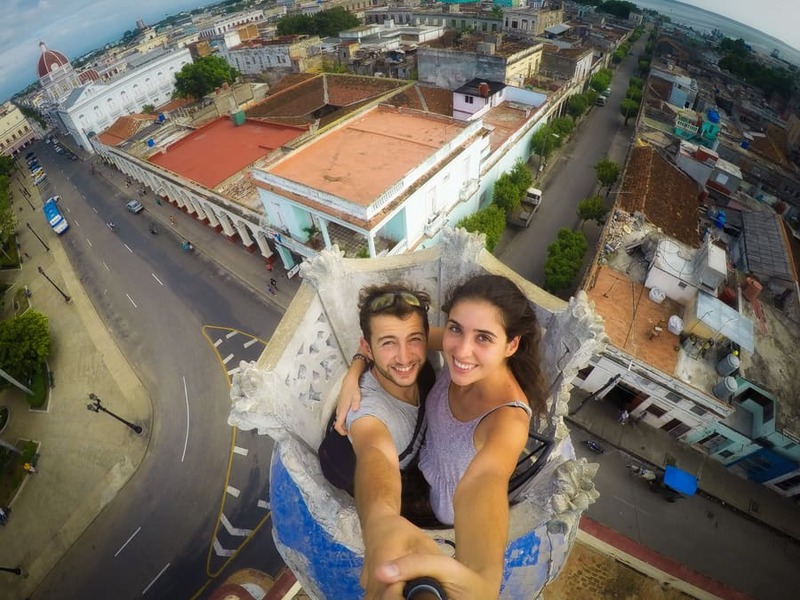 As we have already said in the complete Guide to planning your trip to Cuba, to make the journey between Havana – Cienfuegos, we can use different modes of transportation. The most recommended one in this case is the private bus that can be booked at any hotel, whether or not you are staying there. 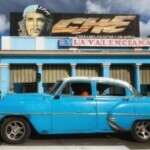 This way, you will not have to go to the Viazul station, which is on the outskirts of Havana. For the same reason, we decided against another option which was a shared taxi. Shared taxis also depart from the Viazul station, so not choosing this option saves us that journey. After having tried the shared taxi, I will tell you that they are not a good option for long trips. These taxis usually carry three or even four people at the back, which is very uncomfortable. The worst part of making this trip by bus is that it takes four and a half hours. We made two stops, and one of them was quite long. 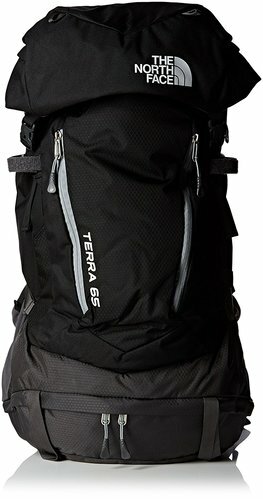 Considering this, I think it is the best option, for the price and the convenience. 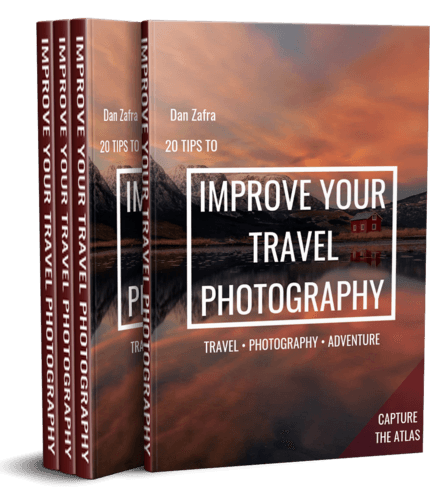 As we discussed in the travel budget, this trip cost 22 CUC per person. As a reference, the Viazul bus would cost 20 CUC, and by shared taxi would be 17 CUC. 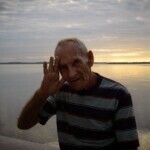 Do not forget to come back here to tell us about your experience traveling through Cienfuegos in one day.